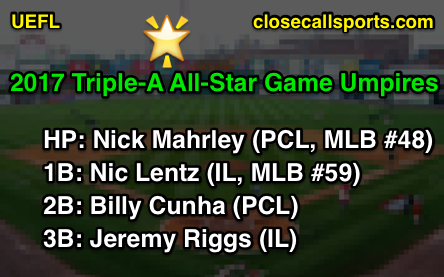 Your 2017 Triple-A All-Star Game umpires are Nick Mahrley, Nic Lentz, Billy Cunha, and Jeremy Riggs. 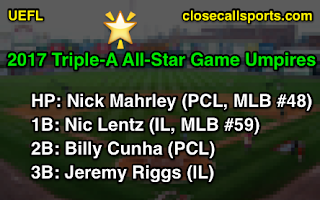 HP Umpire: Nick Mahrley (PCL, 4th year; MLB #48). 1B Umpire: Nic Lentz (IL, 4th year; MLB #59). 2B Umpire: Billy Cunha (PCL, 3rd year). 3B Umpire: Jeremy Riggs (IL, 2nd year).